Evel Knievel has left the building, literally. The famed American stunt motorbike rider passed away Friday at age 69. Considering how many times Evel crashed jumping buses and fountains, that's about 49 years longer than most people anticipated him surviving. The bloke broke bones in his body that most of us didn't realise we had. The man was a daredevil in the real sense, in that there were no tricks or fakery to his stunts. When Evel was on the telly, the one clear thought that popped into everyone's minds was, "I might see a man die on telly today." We very nearly did several times. His sense of grandeur was as large as the stunts he attempted, and occasionally pulled off. The spangled uniform, the wild stories... he even literally "jumped the shark" at one point...several of them as a matter of fact. Even Happy Days' Fonzie only managed one. Attach a rocket to Evel's coffin and launch it over Snake River Canyon. The parachute won't get in the way this time because, quite frankly, we don't need it. Attach Evel's coffin to a motorcycle and jump 12 buses and a tank full of sharks at the same time! Worst case scenario - the sharks are allergic to motor oil and spangles. Cremate Evel and put a little of him in every Evel Knievel action figure. That way, Evel can, in some strange way, re-experience jumps and crashes again and again. Attach Evel's coffin to a giant catapult. Fling it over a casino. Take bets as to how long Knievel can stay in the coffin and which hotel room he lands in. Replay Viva Knievel! on Turner Classic Movies for 48 hours straight. Finish by having Robert Osbourne jump 12 lorries on a moped while Evel's coffin looks on. Have every NFL team wear spangled uniforms, motorcycle helmets, and capes this Sunday. As part of lawsuit settlement - Kanye West jumps Evel Knievel's mausoleum on a motorcycle. The mausoleum is a life-sized replica of the buses Evel jumped in London. Change all Evel Knievel pinball machines so that the ball out area is renamed to "Evel's Final Resting Place." Three words: "Coffin Moon Launch"
President Bush declares this week "National Jump Something Crazy on a Motorcycle Week." Several people attempt to jump over Dennis Kucinich. Despite the title, this little piece is not a surefire guide to women ridding themselves of their deadweight husbands/boyfriends/35 year-old unmarried sons living at home. For those see, in order, any current edition of Cosmo, Us, or Guideposts magazines. Pretty much any American family that didn't have Thanksgiving dinner at the local Denny's has some kind of leftover turkey in the fridge right now. Either you hosted a big dinner and got stuck with the bulk of the bird, or (as is the case with my family most years) you visited family and found 4 large zip-loc bags of the stuff hidden amongst the luggage when you got home. The simple problem is what to do with it. Turkey isn't the most versatile of fowl in the first place, which is why there's always so much excitement whenever someone develops some new gastronomical approach to the old bird, like the radical act of deep frying one whole, or... the turducken. There are other approaches however, and the following list offers some hope for those of you tired of turkey soup, turkey sandwiches, turkey pasta, turkey pizza, turkey couscous, turkey delight, and turkey ice-cream (Iron Chef fans know what I mean by this last one.) So, read on intrepid person saddled with leftover turkey, and you may just escape the turkey blues. Oh yes, for legal reasons, our loyal barrister F. Johnny Lee reminds me to note that DOUI is not responsible for any consequences of anyone actually applying any of these remedies. These are for entertainment purposes only. You can take the drumstick out of my back now F. Johnny. Turkey Dog Food - Of course most people have already figured that one out themselves. I'd personally guess that about 75% of all leftover turkey consumed is eaten by dogs, cats, and very large budgies. Turkey Plant Food - Grind it up and fertilise. At the very least, the local racoons or rats will have a field day, poop in your garden and the end result is the same. Turkey Spacktackular - Mrs. Fando offers the suggestion of spackling any holes in the walls with leftover turkey. This works best with textured walls and homes that already smell heavily of hickory or mesquite. Tower of Turkey - If you can use toothpicks and leftover popsicle sticks to build model houses and bridges, why not leftover turkey? Build a box-girder bridge from dark meat and rib bones! Construct a replica of Donald Trump's elaborate digs with leftover breast meat (Donald's favourite!) and leg bones almost as skinny as The Donald's wives'! Turkey Frisbee - Tired of chasing that lousy, plastic little frisbee on windy fall days? Try a slice of lean turkey instead! It flies shorter and straighter and if it winds up on your roof, just leave it for the crows and go grab another slice! Even dogs that hate to chase frisbees will go for this one, although you'll never get it back from them without a fight. Turkey Fashion - Turkey slices can be used to bolster and accessorise a variety of fashion choices. Need to bolster those shoulder pads or bustiers, ladies? A thick slice of breast meat will do the trick. The giblets will make stunning jewellery and a wishbone belt is all the rage on the Paris runways, or will be any day now, given that French fashion designers are all nutters. Turkey Ornaments - Christmas is coming and one way to get in the spirit of things is to convert your leftover turkey into decorative ornaments for the family tree. A bit of tinsel and that dry slice of leg meat is now a festive decoration! The one downside is that pets will knock over the tree a bit more than usual. Turkey Greeting Cards - If you're like me, you probably always forget the greeting cards each year until the last moment. Why not send turkey this year? A large slice of turkey is most substantial and more personal than some banal verse and a stock winter holiday shot. 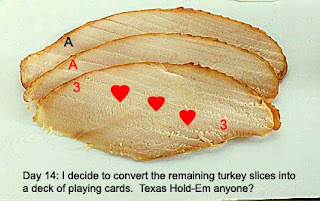 Plus, turkey slices cut easily into a variety of shapes. You can even wedge a picture of the kids in a turkey slice for grandmum! Now, when she gets your greeting card and remarks, "That turkey!" she might not be referring to you! Turkey Self Defense - You'd be surprised at how well a bit of old turkey will cut and shapen into a deadly shuriken! Tune a Turkey - Cut and dry those turkey pieces at different lengths and soon you'll have your very own xturkeyphone. Use the bones as drumsticks and make those leftovers swing! Small bits of turkey also make excellent guitar picks. 1. Whereas, the bane of any British household at this time of year, or for that matter, any time of year, is the half-finished jar of marmite in the cupboard. Might I suggest a marmite and turkey sandwich?